Advice to care for my new Phalaenopsis Orchid Indoors? This lovely Monopodial orchid (is that right?) was a recent house warming gift from a thoughtful friend! I have never grown orchids of any type before, and I am hoping you can share with me some helpful tips for taking care of this beauty indoors. I live in Greenville, SC and I suspect this type of orchid cannot be raised outdoors, however I do have a garden window that might be fine. Comments for Advice to care for my new Phalaenopsis Orchid Indoors? Hope you are settling in to your new home. Orchids are a nice housewarming gifts. Now you have to figure out how to care for your beauty. Yes, by your picture I believe that this is a lovely, Phalaenopsis Orchid. And yes you are correct, this Phalaenopsis is a monopodial orchid. If you are new to growing orchids I would recommend that you go to two different pages on my site. There is an excellent page just on Phalaenopsis orchid care. You can reach it from the navigation bar on the home page. The other is a "FAQ" page, or frequently asked questions. There is tons of free and good advice from questions people have asked me over the years. I do not know what the weather in Greeville, SC is like year round but in general in most places I suspect this orchid is an indoor plant. You can email be with the weather and I can give you better advice. 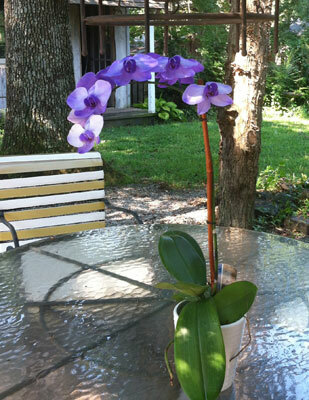 For now, if you put the orchid near your garden window, take care that it gets no direct sunlight. Phalaenopsis like somewhat bright but not direct sunlight. A few feet off a southern window or with a light shade over the window would work well. Also if you water it do so in the morning. Do not let water pool in the crown of the plant for long periods of time. Phalaenopsis are prone to crown rot. Read the page on Phalaenopsis orchid care to get an idea of how often to water in your situation. Phalaenopsis are lovely orchids. And they often will remain in bloom for many months. Since the flowers are open now, it might still be in bloom for at least a month.